Just Jingle: Except for When Milk Comes Out of My Nose. Just say'n. Except for When Milk Comes Out of My Nose. Just say'n. For reals, though...that's pretty unpleasant. Just say'n. HOWEVER, this adorable Milk and Laughter sentiment stamp from Gourmet Rubber Stamps is NOT at all unpleasant, but rather, it is quite hilarious and super-de-duper-de CUTE!!!! Yup. Totally flippin' adorable. HA! The cardstock here is all Stampin' Up. 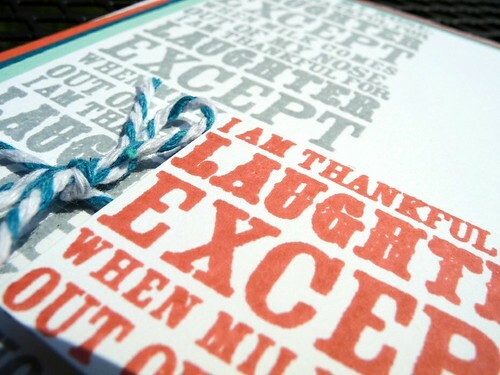 The ink is London Fog Momento and Smoothie CTMH and the twine is from the fabulous May Arts! LOVE! And because some cards simply don't need a lot of explanation, I leave you on this fine Saturday with this! Enjoy! Tee-Hee! 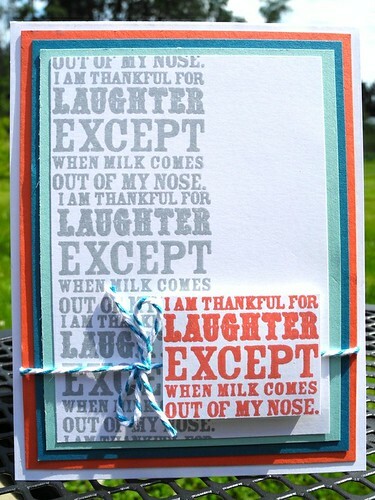 Funny sentiment, and great card! Yep I agree ~ so flippin' cute!!! great job!!! Reminds me of Subway art! Love it! LOL this is too funny!!! LOL!!! totally LOVE That sentiment!!!! OK, I love that stamp! I think the grossest beverage to come out of my nose was Coke...it happened a lot (and not just for laughing!) after I had my tonsils out. Icky! This is a hilariour stamp- but the mind boggles as to when I might use it...birthday card for the mother-in-law perhaps? no no wait! retirement card for the (male) boss!!!!! Too funny! I love how you popped the sentiment in red for some contrast! This is so fun! Love the bright colours.